Whether or not a new 12-plus-inch iPad becomes an actual product, case makers are betting on leaked design specifications, and a new video offers an idea of just how big a so-called "iPad Pro" might be. The comparison of a full-size 9.7-inch iPad Air with the supposed iPad Pro cases was shared by YouTube channel Unbox Therapy on Friday. The cases suggest that Apple's anticipated larger iPad will sport about the same thickness as the current-generation iPad Air 2. 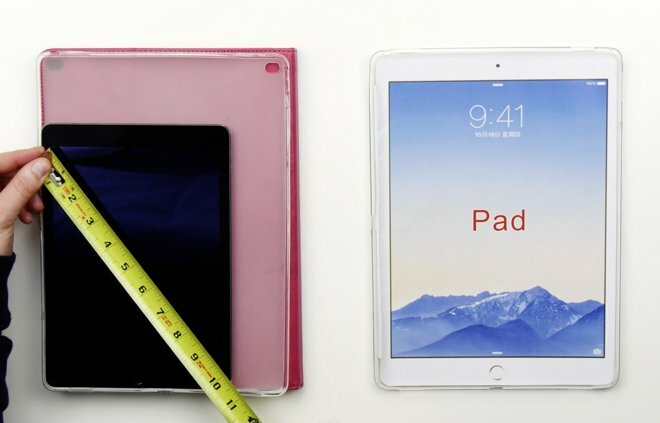 An enlarged printout of the iPad Air 2 scaled to fit the new cases shows a screen that measures about 12.5 inches diagonally, though rumors have suggested Apple will adopt a 12.9-inch display for the new model. The printed mockup features a total width of 8.75 inches, and a height of exactly 12 inches. The diagonal measurement for the entire case is about 14.5 inches. In addition to the 9.7-inch iPad Air, Apple also offers the 7.9-inch iPad mini. It's expected that if Apple does in fact launch a 12.9-inch iPad, it might market it toward professional-level users, including accessories such as a stylus or keyboard attachment, and design changes like a landscape stereo speaker array and potentially the inclusion of a USB-C port for syncing and/or charging. The cases lend support to rumors of stereo speakers, showing four ports —two on each side —when the device is held in landscape mode. They also show space for the traditional power/lock button, volume controls, and side microphone. In addition, both the bottom of the case and the side have identical cutouts. The placement of the cutout on the bottom is where the Lightning connector exists on current iPads. Unbox Therapy noted that the new side port shown on the case does not look wide enough for a SIM card tray, further suggesting that it could be an additional input port for professional users.